Admit it, every one procrastinates. I procrastinated too long even to write this article. I realized that if I wait until I am ready, I’ll be waiting for the rest of my life. So, I am doing it now before the later becomes never. 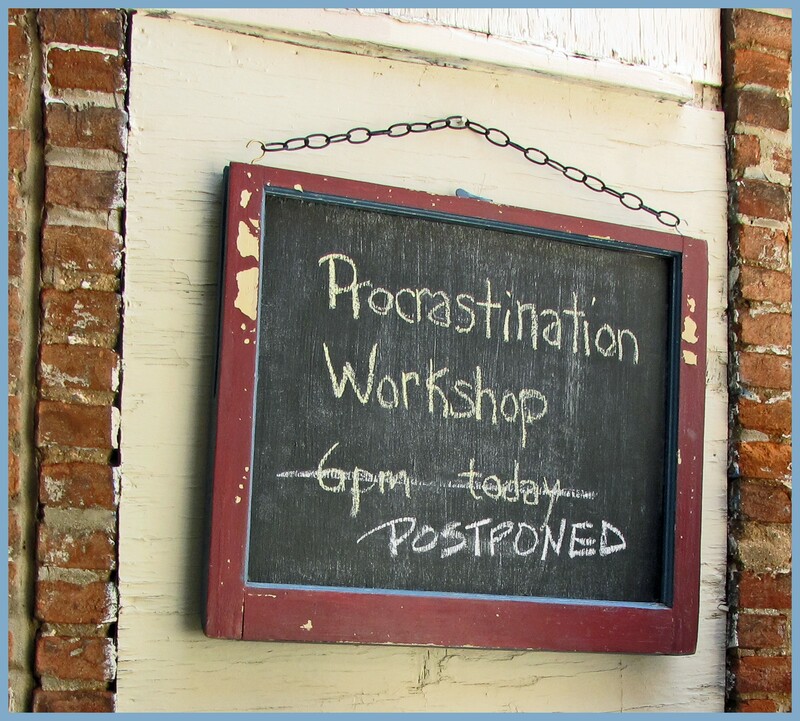 Turns out that according to the research by the University of Colorado Boulder, the urge to procrastinate is inherited. You can blame at least some of your unfinished business on Mum or Dad! In addition to that, there are several other reasons as to why we procrastinate. Can’t do or Don’t know what to do: This basically has to do with a skill deficit. If you lack the skills to do something, it is natural to avoid doing it. For example, I have always wanted to go swimming — Whenever my wife asks me out for swimming, I avoid it most of the time. This is because I have trouble admitting my poor swimming skills and I don’t want to be seen as “dumb”. Procrastinating seems to be a better option than facing the need to improve my swimming skills. Lack of interest: Doing it with the mental burden of not liking it will most likely increase the chances of procrastination. Like when I have to do household chores but I would much rather watch an episode of the big bang theory to find out if Sheldon and Amy break-up just hours after living together (Which I did). Fear of failure: During my school days, I always wanted to participate in inter-school cultural competitions. However, my sub-conscious procrastinator convinced me by saying “What if you really try hard and fail? What if you really get embarrassed in front of the humongous crowd? This is worse than you not participating. Think about it, give yourself a lot of time to practice and you could always participate next year”. So, I did not try and hence I didn’t fail at that point in time. Fear of success: Fear of success can be the other side of fear of failure. In this case, you procrastinate because you are fearful of the consequences of your success. When you achieve something, you get noticed. When you get noticed, you always have the pressure of higher expectations from you next time. Inactivity or procrastination might be the way you cope with the pressures. Laziness: This is my favorite one! I am lazy like you all 😜 Sometimes, I don’t feel like doing my regular exercise. I just want to sit and relax watching TV. Being lazy doesn’t always have to be a bad thing (Especially when you are watching “Mr. Robot”😉) . However, don’t let that behavior become habitual. Okay, We all get it. We do procrastinate for some reason. But how do we procrastinate the procrastination? Do we have any success mantra to overcome procrastination overnight? Do I need to attend some fancy anti-procrastination program spending hundreds of 💰? Procrastinating the procrastination may not be easy, but it’s simple. You don’t need to take a course or buy a product. All it takes is to get a little help from yourself. Be it 10 minutes or an hour, be focused. Distractions won’t help you get focused. According to data from 1.5 million users of the Android App Locket, the average person checks their phone upwards of 110 times daily. Keep your gadgets out of reach, close your Facebook, Twitter and Email tabs. In fact, eliminate the temptation by switching off your Internet altogether. If you regularly pay attention to the cultural shenanigans of Silicon Valley, you could have probably heard this term “Learn to code”. Jumping into the bandwagon of becoming the next coding Ninja does indeed look fancy to impress your friends and colleagues. But, getting to know how to code can be overwhelming and intimidating. At some point in time, you will start procrastinating when you don’t know what to do and can’t decide between choosing C# over Java or Android over iOS (for example). The idea is to start a task with a small, imperfect step. Start with the basics, learn how to write a pseudo code first and continue breaking down your learning journey into simple steps. By doing this, you are ignoring the big picture for a while and just tackling the next small task by making sure that you can visualize the outcome of your small task. After you are comfortable, you can reiterate the big picture to use it for motivation and direction. This term is coined by Wharton’s professor Katherine Milkman. A couple of years ago, she was having trouble going to the gym on a regular basis. She chose listening to her favorite audio books of fiction novels like “The hunger games” over going to the gym. Yes, you guessed it right — She procrastinated like you and me. She didn’t want to give up her guilty pleasure of listening to audio books. At the same time, she wanted to be fit as well. She came up with this following idea. She is allowed to listen to these insipid audio books only when she was at the gym. The results were mind blowing — She began hitting the gym 5 days a week. The beauty of this technique is, it allows you to achieve your goals on a consistent basis by not giving up on your guilty pleasures. Sounds great? How can we apply this to our own life? There are other anti-procrastination strategies too like maintaining a To-Do list, setting time-bound goals, creating an action plan etc. I will leave it for you to explore and research more about it and understand which strategy suits you the best.